This shop is written in Swedish but you can order, pay and check out direct in the webshop If you are from one of the countries below. Åland Islands, Norway, Belgium, Estonia, Latvia, Lithuania, Luxembourg, Netherlands, Germany, France, Austria, Cyprus, Bulgaria, Greece, Ireland, Italy, Croatia, Malta, Poland, Portugal, Hong Kong, India, Japan, Faroe Islands, Monaco, Svalbard and Jan Mayen, Canada, USA (US), Australia, New Zealand, Georgia, Bosnia Herzegovina, Iceland, Liechtenstein, Monaco, Switzerland, Serbia, Denmark, Finland, Brazil, Falkland Islands, Slovenia, Slovakia, Spain, Czech Republic and Hungary. If you are from another country, so of course you can order from us. Just order as usual and fill out your details such as name, address, e-mail and phone number. Then type in the message box if you wish to pay by Visa or MasterCard. Or if you want to prepay to our bank. After we have received your order, we will send you an e-mail with Proforma Invoice, freight calculated and the total cost. And of course, payment instructions. 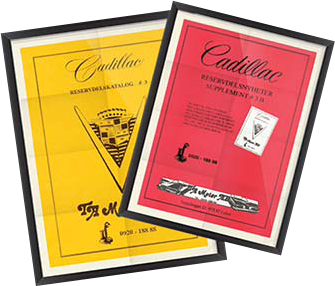 When the money arrived in the bank or card account, we send the Cadillac parts to you. We understand that Swedish is not so easy to understand, but with English, or perhaps a translation program, we will understand each other. We have been selling parts all over the world using Swenglish and good mood, so just send an e-mail to info@tamotor.se Just write down what you want to buy or just your questions, we will answer you with northern reliability. Welcome! För att kunna handla i vår webbshop måste du först välja en årsmodell.